In 2003 this film won the IAC Daily Mail Trophy and a silver medal at UNICA. The inspiration for the film “Joseph’s Faith” came from a book I had come across some twenty years previously. Over the years I have read a great deal of literature concerning Hitler’s near annihilation of European Jewry, so much so that the actual title of the particular book escapes me to this day. 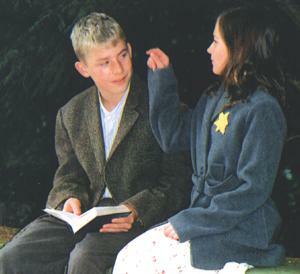 However, the central theme of the story – how a young, un-circumcized Jewish boy with Aryan looks was sent from Germany to Poland to warn the Warsaw Ghetto Jews of their fate – remained firmly embedded in my mind. Nonetheless, creating a film from this literary theme would prove to be a daunting one on a number of accounts. Unlike previous years when a single week is set aside during the summer holidays for a film project, colleague and cameraman Frank Hodges and myself had also been asked to provide a film summer school for gifted and talented pupils throughout the city. This meant sandwiching the main film project in the Lake District between two outer weeks. While readily accepting this offer, principally in view of an agreement reached with the authorities to finance the making of “Joseph’s Faith” from summer school funds, it did result in a rather exhausting three weeks. My proposed film script was also to cause initial problems. 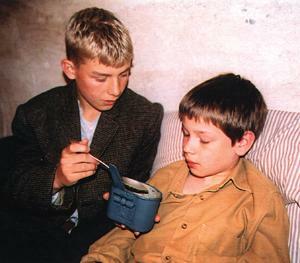 The knowledge of the boy’s mission to the Warsaw Ghetto would only become apparent towards the end of the film. 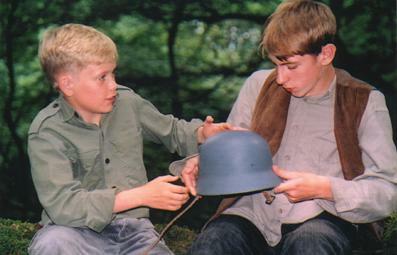 This meant a number of lengthy discourses between him and the German boy he befriends to build up to this point. Filming protracted dialogue outdoors of course presents numerous difficulties, so it was decided to film as much as possible indoors. But where? Before our week in the lakes, Frank and I journey over to investigate thoroughly the house where we always stayed. The lounge was a possibility but lacked atmosphere for the more poignant scenes while the small outbuilding was somewhat cramped thus curtailing camera movement. Both of these interiors were utilized during the film but the discovery of the ideal location came purely by chance. On explaining our dilemma to an inquisitive owner, she wondered whether the cellar might be of some use. Unaware that the house even possessed a cellar we were both intrigued and delighted when a hitherto un-suspected airing cupboard was unlocked to reveal a winding stone staircase leading to two half-lit rooms. We could already experience the atmosphere necessary to carry the heavy script and our minds were finally made up when we noticed a beautifully intricate spider’s web at the bottom of the steps. We should have filmed that there and then, however, the eventual intensity of the week’s filming erased it completely from our minds. Many colleagues, pupils, friends and contacts contributed to the success of “Joseph’s Faith” but pride of place must go to the four boys who worked so hard and uncomplainingly throughout the week in the Lakes. Well done Adam, Christopher, Samuel and Jonathan for showing such great resilience in your inaugural film venture.